Inflatable Kayaking or stand up paddle boarding (SUP) – It’s just you, your craft, rapids at “face” (or feet) level, and guides leading the way giving you tips, encouragement, and a helping hand when needed. 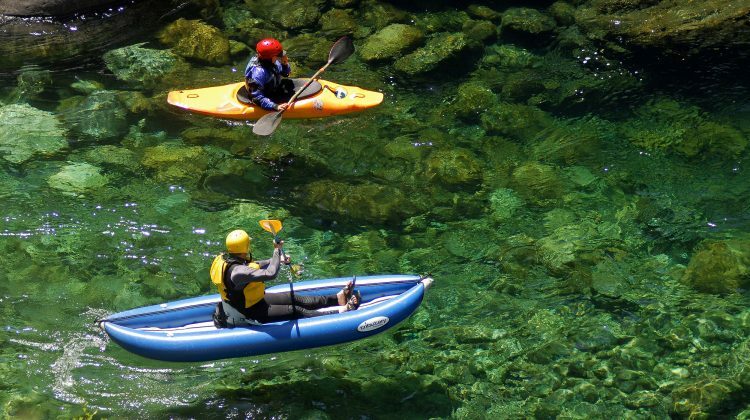 Navigating your own inflatable kayak or stand up paddle board is a unique and very exciting way to experience rivers and they add a whole new dimension and sense of adventure to a trip. You are free to explore in a small and maneuverable craft, to feel the rapids up close and personal, and ultimately to test your new river running skills. While you do need to be in reasonable physical conditions you do not need to have any previous rafting or kayaking experience. The inflatable kayaks have a quick learning curve and we start with a dry land session where you learn basic river hydrology, how to read rapids, and basic paddle skills. We then have some on river practice and soon begin making our way down river. A guide is always close by to help you pick your lines, give you tips, and of course, if needed, to fish you out of the water. Stand up paddle boarding is a quickly growing sport, especially in lakes and oceans, and the river adds a whole new dynamic to it! They are basically very large surfboards (also known as S.U.P.’s), that you stand on with a long paddle for propulsion. These craft have a steeper learning curve and require good balance. However, those who have surfed before will pick it up quickly and even total beginners will be able to stand and maneuver in the gentler sections. The following are trips that offer an SUP or inflatable kayaking option, or are all inflatable kayaking. You can also Build Your Own Small Craft Trip on many of our rivers. 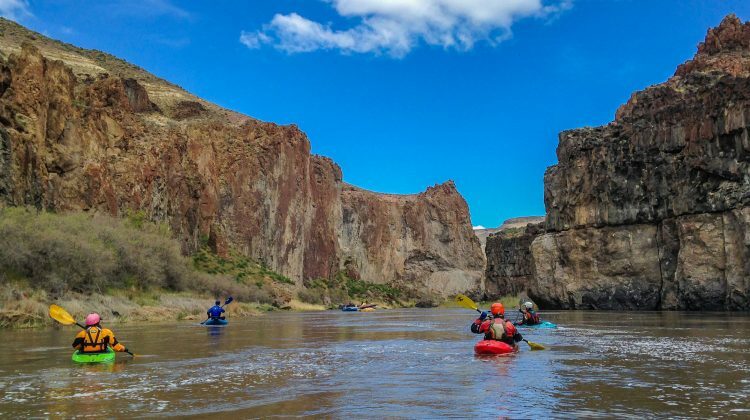 Our Lower Owyhee Inflatable Kayaking Expedition spends 6 days immersed in one of the most remote, wild, and beautiful areas of the United States: the 'Grand Canyon' of Oregon. 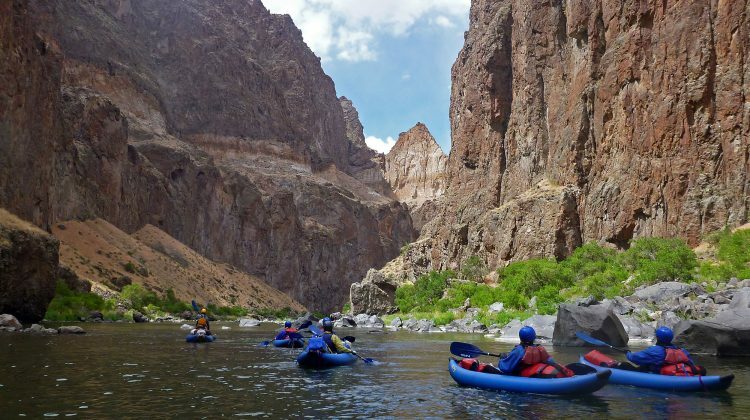 Clear Creek is like no other stretch of river in the country & one of the most unique trips we offer. The trip combines high adventure, spectacular beauty, pop-up riverside glamping, & a chance to run a stretch of river that is rarely seen (or even heard of). Join us in spring on a journey down one of the country's great wilderness rivers on high adventure kayak-focused trips. It’s just you, your own personal craft, rapids at “face” level, and guides leading the way. 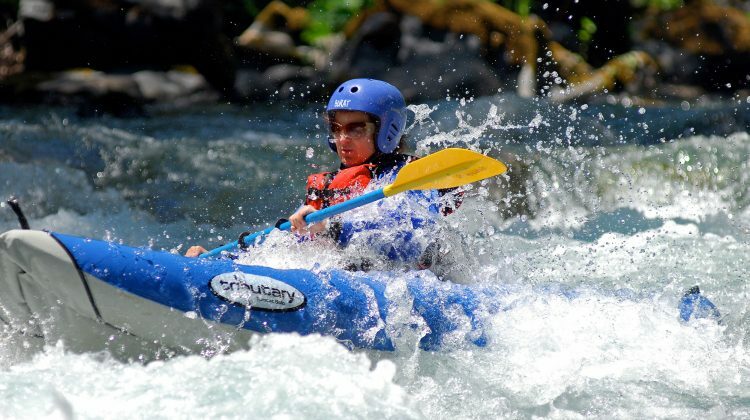 Inflatable Kayaking on the Rogue River - It's just you, your kayak, rapids at "face" level, and guides leading the way. 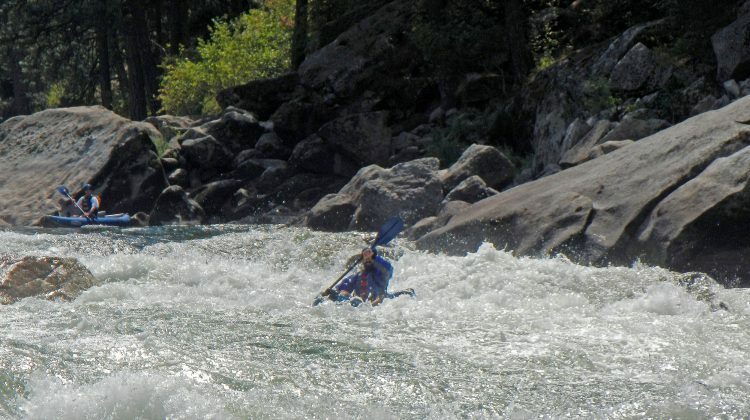 The style of whitewater on the Rogue makes it one of the best wilderness rivers for Inflatable Kayaking. Inflatable Kayaking and stand up paddle boarding on Idaho’s Salmon River - It's just you, your craft, and rapids at "face" (or feet) level. 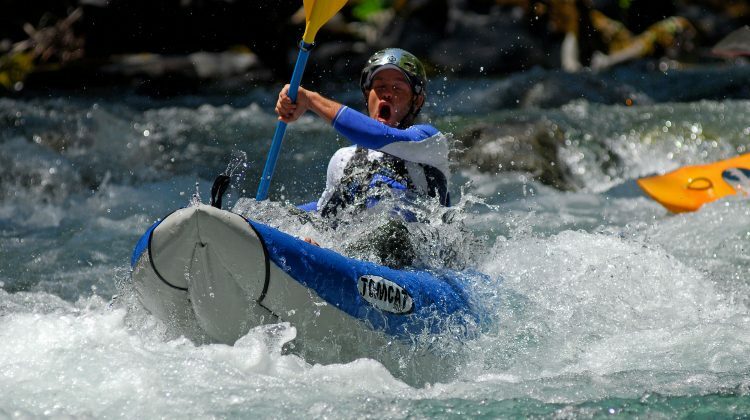 The style of whitewater on the Salmon makes it one of the best wilderness rivers in the world for Stand Up Paddle Boarding and Inflatable Kayaking. 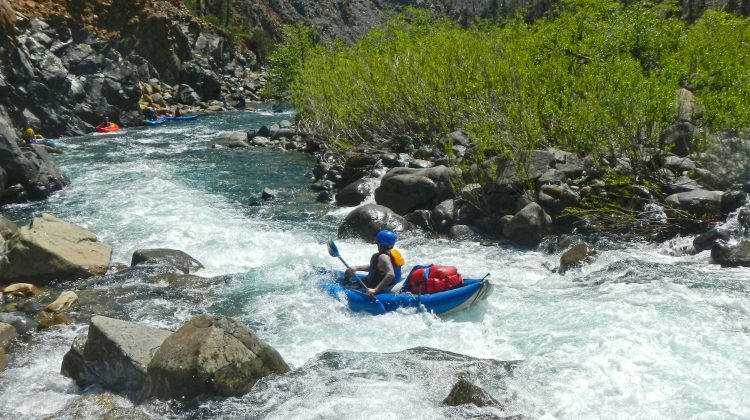 Join DeRiemer Adventure Kayaking and Momentum River Expeditions for guided hard shell kayaking and instruction on some of our favorite wilderness rivers. Phil and Mary DeRiemer are nationally recognized Kayaking instructors & recipients of ACA’s Legends of Paddling Award. We are proud to operate under Special Use Permits granted to us by the Oregon Marine Board, the Bureau of Land Management – Klamath Falls Resource Area, Medford Oregon Resource Area, and the Vale District – and The U.S. Forest Service – Ashland Oregon Ranger District, Happy Camp Ranger District, Rogue River-Siskiyou National Forest and Idaho’s Salmon-Challis National Forest. We also offer trips to Alaska through Momentum Alaska which operates under Special Use Permits granted by Glacier Bay National Park & Preserve and Tatshenshini-Alsek Park. We are an equal opportunity recreation service provider. All trips operate on a non-discriminatory basis.